LEWCO Aluminum Die Delivery System - LEWCO Inc.
A premium manufacturer needed to move large aluminum dies between processes. To maximize floor space the system was suspended from the roof structure, and accessed via vertical lifts to each work area at floor level. Overhead space was limited, so transfer and turntable units were custom-designed to fit the required envelope. The conveyor equipment was also fitted with UHMW side guides, and urethane roller sleeves, to protect the aluminum dies from damage and wear. Pop-up transfers utilized flat timing belts, instead of chains, for the same reasons. 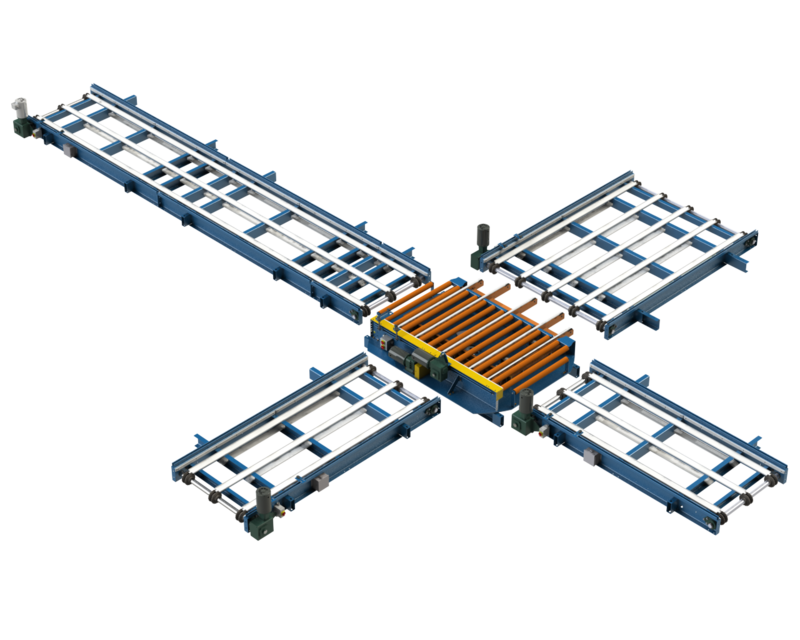 For long runs of transportation conveyor, it was more economical to use multi-strand belt conveyor, with narrow modular plastic belting for the strands. Together with the Poly-V driven roller sections, these equipment choices gave the customer a quiet, smooth-running system. The conveyors were fitted with product sensors, wired to junction boxes on each shippable section. At-motor disconnects were also mounted and wired at LEWCO. This saved the customer some valuable field wiring time, and helped keep the installation on schedule. LEWCO project management worked with the customer to coordinate shipments, so that the equipment was delivered in the sequence needed for installation.